KDOC is a web-based Document Management System and Commnication Platform designed to effective manage the project team integretion within architecture, construction and investment industries.KDOC was developed for and together with established companies in their industry. As a web platform for managing projects and changes , KDOC allows all involved Stakeholders (investors, consultants, project team, customer and subcontractors) to transfer, manage and archive the project relevant documents. By using the KDOC-system was created more transparency and efficiency within information-flow , and has been avoided unwanted conflicts caused by poor communication. The index/version management of the plans and drawings ensures that all project members use the same valid version of the plan/drawing. All the user transactions are logged on a document based logging-database. It is very easy to follow the whole life cycle of a document or a plan/drawing by monitoring the date/time when the project members have sent, read or modified it. 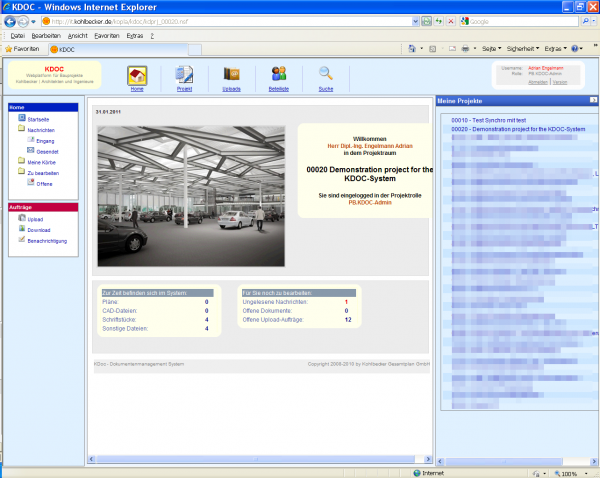 Lotus Domino Web Server and XPages Interface. Framework based on a Model-View-Controller (MVC) software architecture.